There are book clubs and then there are BOOK CLUBS! The Gals at the Cascades have one of THOSE BOOK CLUBS. You know the kind I mean… a book club that everyone wants to become part of. They read great books, share yummy snacks, have interesting discussions …and grow their membership. In fact, their membership eventually outgrew itself and the club had to be split into two groups – one group that meets in the morning and one that meets in the evening. Both groups read the same book and both discussions are led by the same amazing woman – Kathleen Lundman. SO HOW LARGE SHOULD A BOOK CLUB BE? In 2011 the discussion of Cracks in the Sidewalk was held in the Cascades Auditorium – both of the Cascades Book Clubs were combined into one mega group and the meeting was big, a bit noisy and lot less personal. The gals listened attentively, but were somewhat hesitant about asking questions or giving voice to their opinion. This year, Kathleen changed the format, kept the two clubs separate and held both meetings in the somewhat smaller Clubhouse Library. I spoke at the morning meeting, came home and spent the afternoon with my family of fictional friends, then returned for the evening meeting. This time the discussions were lively and full of vitality. The club members went way beyond discussing just the aspects of the book (although I am happy to say they all loved it) but they also wanted to know what prompted the idea for the story, who different characters were based upon and the techniques I used for story development. Both the morning and evening meetings were this way, and I can’t begin to count the number of gals who came over to me after the meeting and commented on this time they felt as if they had gotten to know me personally. The funny thing is …I felt the same way about them. Was it the size of the Room? The floor-to-ceiling books that surrounded us? The size of the group? Although there is no way to say definitively that it was attributable to one thing or another, I believe that when a book club gets too large it loses a certain amount of intimacy and becomes simply a ‘book club’ as opposed to a group of good friends who get together to discuss a book…and so much more. Kathleen’s decision to keep the clubs as two separate groups was an excellent one. And based on my experience I would have to say that yes, a book club can become too big. And those who are facing such a situation, I’d probably suggest taking a page from Kathleen’s book and splitting it into two groups…all you need to do it is a fearless leader who is willing to step into the great big shoes Kathleen Lundman wears. 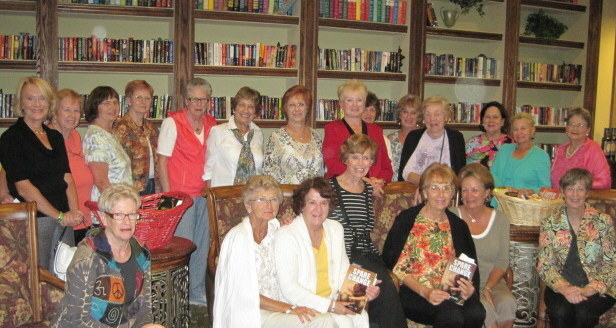 Big or small, there’s no denying book clubs are fun…a lot of fun!